I read this article and found it very interesting, thought it might be something for you. 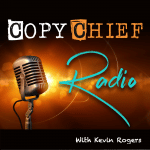 The article is called Ep 119: Why Certain Copywriters Get Paid Better and is located at https://copychief.com/ep-119-kevin-rogers/. I had a bit of a “eureka” recently around why some copywriters seem to skyrocket to industry stardom, while others feel tethered in place. What’s making the difference here?